Well Intervention Market size is set to exceed USD 18 billion by 2024; as reported in the latest study by Global Market Insights, Inc. Growing number of matured oil fields coupled with rising concerns toward depletion of conventional reserves will foster the well intervention market. Ongoing development of urban areas across the emerging economies along with rising demand for petroleum products will propel the industry growth. In addition, rapid technological advancements across the oil field services sector will enhance the technology adoption. Accelerating number of stripper and marginal wells along with increasing demand for crude oil will foster the artificial lift systems market. Reliability, limited risk exposure, and ease of drilling across the subsea intervention are some of the key features which will propel the business growth. 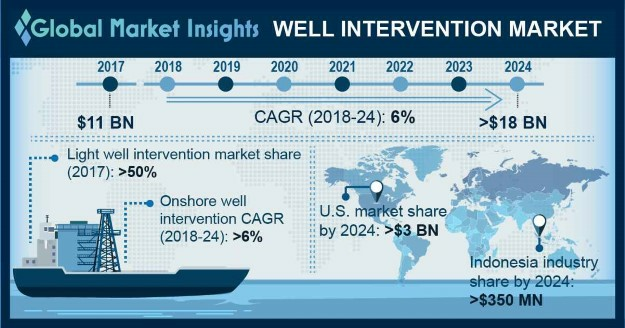 Increasing focus toward development of unconventional wells coupled with favorable regulatory policies to enhance oil production primarily across OPEC countries will fuel the well intervention market.